Those cords make me want to run to Gap immediately. I'm so loving your jacket! Looking fab with the denim shirt too! I must say that this is by far one of my most FAVE outfits you've ever worn. The denim shirt, the coat that looks just AMAZING ON YOU, THAT necklace & THOSE SHOES. You look picture perfect, and I could not be more jealous of your style, clothes, hair, and adorable smile! Dying for those Gap cords! I adore the color! Loving this outfit and these photos! That necklace is the perfect detail with this outfit. You look fantastic! JCrew had a special and I was able to get those pants on sale! Dying for the other colors. If I get my rewards card, I'll definetely get another pair! 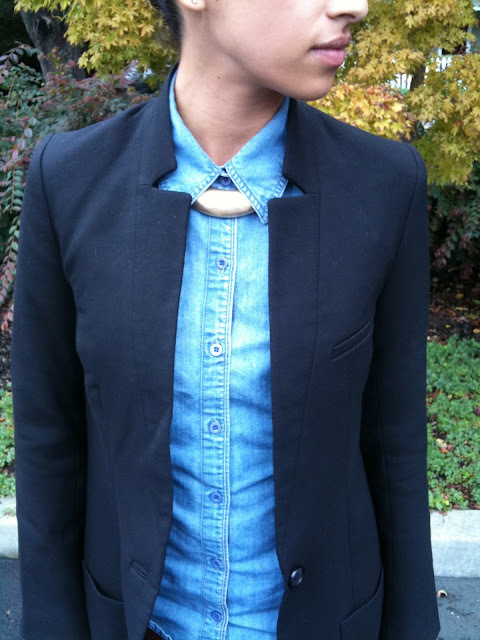 Corduroy + denim + collared necklace -- you are literally wearing everything off my must-try fall trends list. CHIC! you are way too cute! LOVE this look from head to toe! I'd wear it in a heartbeat! This outfit is awesome! Love how you styled the necklace! love this look!! you pull it off so well! xoxo. I'm really into this look. The color of those pants is rad! Yes! I love it.. I am especially loving that coat! thanks friends! Like I said one of my favorite looks ever!! !